Without thy help, by me be borne alone. Yet doth it steal sweet hours from love’s delight. As thou being mine, mine is thy good report. The essence of this poem is expressed in the first three words: Let me confess. The speaker is confessing that he has done something wrong, the result of which is the separation of the two lovers. This sentiment is echoed in line 10, where he mentions guilt and shame. As this is another of the fair youth sonnets, where Shakespeare is expressing his love toward a young man, I am curious as to what it was that the speaker did which would have caused such a public disgrace that the two could no longer be seen together. I cannot find any hints in the text as to what might have happened. But the emotion is clear. There is regret on the part of the speaker for his part in the separation, a feeling that too many of us have experienced in our past failed relationships. It’s strange how often I read something and discover it relates to events taking place in the world around me. Many of us are outraged at the lenient sentence given to Brock Turner, a mere six months for sexually assaulting an unconscious woman. As such, I found it serendipitous that Double Falsehood, written over 500 years ago, also addresses the issue of the sexual violation of women. For those of you who do now know the history of this play, it is thought to be a lost Shakespeare play. The play has only recently been attributed to him and added to the collection of Shakespeare’s works. If you are interested in reading more about the history of the text, check out this Wikipedia page. Anyway, I want to focus on the text. First off, I want to point out that one of the central female characters, the one who is sexually violated in the beginning by Henriquez, is named Violante. I instantly noted the similarity of her name to the word “violate.” Remove the “n” from her name and you have violate, symbolizing a violated woman. After forcing himself on Violante, Henriquez tries to convince himself he did nothing wrong, that even though she resisted, she did not resist enough and therefore acquiesced in his mind. Afterwards, as is often the case with victims of sexual abuse, Violante feels guilt and shame. Whom shall I look upon without a blush? To say I was not willing? One’s self necessitous and wretched. In her despair, Violante escapes to the country and disguises herself as a young boy. But her master figures out she is actually a woman and also tries to violate her sexually. Come, you’re made for love. Will you comply? I’m madder with this talk. There’s nothing you can say can take my edge off. She manages to escape her new attacker, but is then wracked with guilt and despair. Sadly, she considers suicide as the only way to rid herself of the pain she feels as a result of her violation. And childish love have made thee so – go, die! That can bring comfort but a quiet grave. And those to come shall sweetly sleep together. While this is certainly not one of Shakespeare’s best works (if in fact it truly is the work of the bard), it’s an easy read and worth checking out, if nothing else but for insight into a social plague that still vexes us today. All sexual assault should be condemned and perpetrators given punishments that suit the crimes. But let me not get too high on the soapbox. Give the play a read and feel free to share your comments in the space below. Thanks for stopping by and showing an interest in literature. 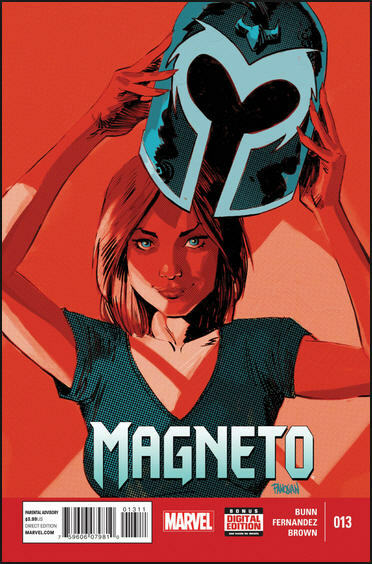 Just as I was thinking about discontinuing reading the Magneto series, I was reminded of how good it is and how thought-provoking the writing is. This issue is excellent and explores something I find fascinating: how stories affect our concept of reality. Stories, when repeated, become part of the fabric of our collective consciousness. They teach us things about ourselves and build a bond which helps hold our society together. On a level, we know that these are just stories which, although fiction, express universal truths regarding the human experience. But sometimes, as this comic points out, people begin to accept these stories as facts which lead to the birth of urban legend, and in more extreme cases, self-deception. What is the appeal of ghost stories? Gathering around a darkened room… speaking in whispers… recounting the tales of monsters that lurk in shadows. Is there comfort there? The reminder that… while we speak of the dead… we are all truly alive, or is it purely for the thrill? The pumping heart… the racing blood… the trembling flesh. Among these tales of terror… the “true” ghost story is among the most offensive. “Listen,” you say. “This is what happened to me.” You know the entire time that your every word is a lie… and your audience realizes the same… although they force themselves to believe. And so it is the ghost stories we tell ourselves… when no one else is listening… that are the most egregious. Lies for our own benefit. “This really happened to me.” Lies we force ourselves to believe. This hit painfully close to home. When I was younger, I lied to myself as a way to justify my actions and to absolve myself from guilt and shame. In these stories I forced myself to believe I was the hero. I twisted history to view myself as making the right decisions, to validate the choices I made, to make it easier to live with myself. It was a coping mechanism for me and one that I suspect many people still rely upon. It is painful and difficult to look at yourself and judge your actions honestly, but it is important to do so. This is the only way that you can grow as an individual. As you know, I love stories, but I must be careful not to allow stories to distort my view of reality. It is appropriate to use stories as a way to interpret reality, but it can be a slippery and dangerous slope when we allow stories to define our reality.